Robots are taking all kinds of jobs. 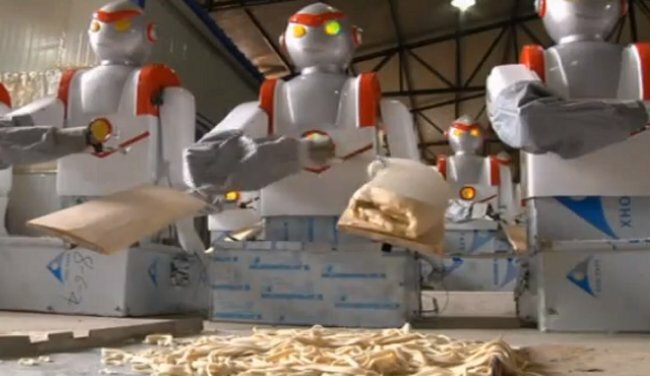 The latest job that robots are taking is that of noodle cutting in China. Cui Runquan produced a noodle cutting robot called Chef Cui a while back and they are now being mass produced. You will see them soon in various noodle serving establishments throughout China. It turns out that a robot noodle cutter is much cheaper than a human. Priced at $1,500, it’s a bargain compared to an employee doing the same thing, which costs a restaurant about $4,700 a year. He made the robot because younger people just don’t seem willing to cut noodles these days. If that’s the case, maybe they aren’t taking too many jobs after all.